Throughout the interior of Montpelier one of the most challenging problems was determining how the walls were finished. Because almost all of the Madison-era plaster had been removed after Dolley Madison sold Montpelier in ca. 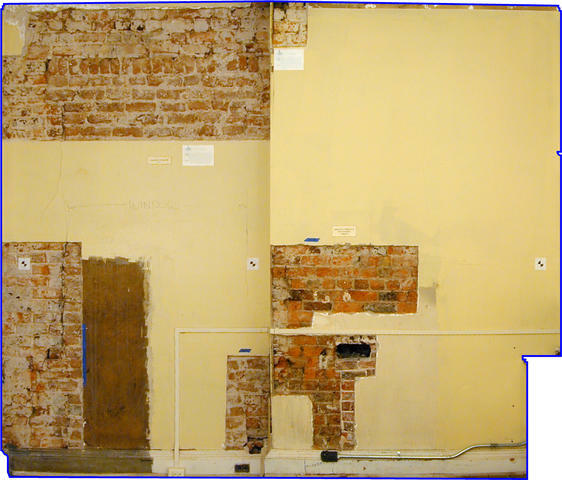 1844, very little physical evidence was left to help the Restoration Team determine what had covered Montpelier’s walls in ca. 1812. Historically, the finishes found in Montpelier in ca. 1812 could have been paint, wallpaper or whitewash, but without samples of the Madison-era plaster it was very difficult to determine what had been used in each room. A section of the North Wing Room's south wall prior to restoration. The ca. 1812 chimney breast is seen to the right.